Welcome to the Articles & Handouts page for StephanieHarvey.com. We are glad you are here! We envision a forum where you can talk freely among yourselves about issues, ideas, questions, and thoughts about literacy teaching and learning, staff development, education policy, and education in general. We will post articles of interest for your pleasure and to stimulate broad based discussion among you. We very much look forward to hearing from you! Anne & Steph's thinking on how comprehension still lays a foundation for all thinking and learning. From The Reading Teacher. 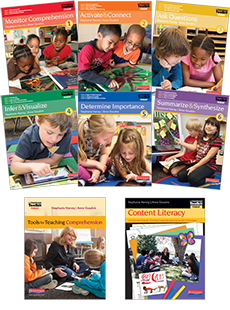 The Common Core Standards expect students to read and understand a wide range of informational text types. Some of those are featured here. The latest post is from Ed Leadership, March 2012. Anne Goudvis and I contributed this article entitled, Teaching for Historical Literacy. It describes a number of essential literacy practices for teaching history with comprehension at the core. Enjoy! I have posted this document on critical reading that Harvard sends to incoming freshman. It has been recently updated at the Harvard site so I have added the link here. Many of you have seen me share it in workshops and we have included it in some of our publications, so I am now making it available here. Enjoy! This is the Comprehension Continuum chart that Stephanie distributed at her recent workshop at the Arizona Reading Association. Our first post is my chapter in Comprehension Going Forward: Where We Are and What’s Next, an upcoming book to be published by Heinemann in February of 2011. Edited by Smokey Daniels, this book includes chapters from some of your favorite authors including Anne Goudvis, Ellin Keene, Marjorie Larner, Debbie Miller, Cris Tovani and more. It takes a look at the state of comprehension instruction today and offers a view of where it is headed in the future. Comprehension Going Forward concludes with a reflective, thoughtful and very compelling afterword by P.